On September 10, 2015, the UN voted for the Palestinian flag to fly at it's headquarters. Soon after the random stabbing of Israeli Jews by Palestinians began. On September 30, 2015 the PA flag was raised at the UN. Increased attacks by Arab/PA citizens, including running people down with cars before stabbing them, have since occurred. 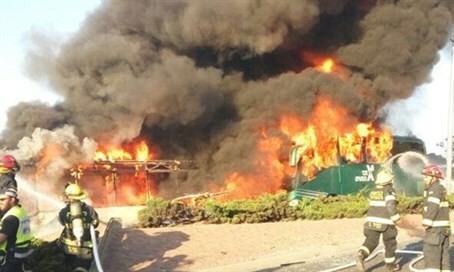 Today a bus in Jerusalem was bombed, which in turn caused a nearby bus to catch afire and blow up. As a result 21 people were injured, some seriously. Hamas, located in the Gaza Strip, has claimed responsibility for the bombing. Every time the UN praises the PA, circumvents negotiations, and hands the PA a political victory, the PA/Hamas starts and or increases violent terror attacks against the Israeli citizens in Israel. ﻿﻿﻿﻿﻿﻿The UN surely realizes by now that making moves to create a Palestinian state without requiring negotiations that would require Abbas and then PA to recognize Israel's existence as a Jewish state that it is emboldening terror attacks against Jewish people in Israel. The UN, which has an Arabic/Islamic majority membership, is rewarding terrorism against Jewish people in Israel. Why negotiate when one can blame Israel when the PA digs tunnels and fire's rockets against it's citizens? Why negotiate when the world is eager to buy into the erroneous and fictitious "reports" of how much "abuse" the PA suffers "at the hands of Israel"? Why try to save lives when they can shoot guns and rockets from schools and churches and UN sanctioned buildings with the intent to have many of it's own citizens killed? Then they yell "disproportionate response" and have the world turn against Israel. Yes, something is very, very wrong here. That is certain. In the midst of such a "big wrong", the fact remains that God, who watches over Israel, neither slumbers or sleeps (Psalm 121:4). It is to Him we will all answer one day.